Salsa... one of our favorite things to make and snack on! Sure, it's easy to go out and buy a jar, but if you make it yourself you will see how much better it tastes with fresh ingredients. Not only will it taste better, but you'll feel good about eating healthy ingredients. We will share all of our delicious salsa recipes, but today we're having Mango Salsa! 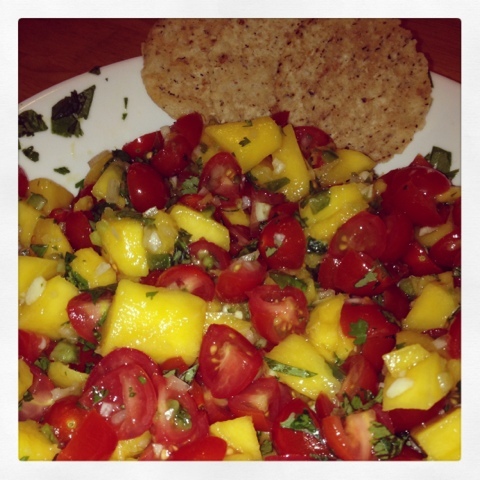 Simply mix together mango, tomatoes, garlic, onion, lime juice, jalapeno, and fresh cilantro! This is the perfect combination of sweet and spicy for all to enjoy! Now simply chop up a few of your favorite veggies for dipping, grab a small handful of whole grain chips and watch the bowl of salsa disappear! No need to feel guilty about snacking with this one :) Enjoy! 1. Peel skin off mangos, cut along the side the pit to remove flesh. Cube up fruit and place in a serving bowl. 4. Squeeze in the juice from lime and add a pinch of salt to taste. Mix well to combine flavors and enjoy!